We’re on the verge of a worldwide NFC explosion. ABI predicts that NFC-enabled handsets available in market will soar fivefold in the next five years to reach 3.5 billion globally by 2019. The business world is beginning to take a real interest. But aside from revolutionising the worlds of retail payments and transport access what other ways can NFC be used creatively to engage with consumers and drive new models of business? The power of NFC deployment lies in the fast, seamless, secure way – via as simple tap – people connect their smartphone with physical media and objects to initiate all kinds of interactions. By uniquely connecting the physical to the digital worlds, NFC can enable entirely new brand-consumer experiences and find its way into new business applications such as interactive advertising, shopper activation and engagement, loyalty schemes, as well as on-package and on-product information sharing. What’s more, any content in the field can be changed dynamically in the back-end, so it stays fresh and relevant. Because NFC lets you gather data about each interaction, it’s also a valuable source of insights into consumer behaviour. Here are just a few examples of real world NFC projects deployed by the world’s most innovative companies using state-of-the-art NFC technology from NXP. BMW Car Hotspot LTE device is an NFC accessory consumers can use to access fast internet on the road. The device allows up to eight users to automatically connect to the vehicle’s WiFi hub by tapping their NFC phone onto the LTE logo of the hotspot. MINI rolled out its own NFC solution for the Mini F56. The ‘key cap’ incorporates NFC and allows users to immediately activate and pair Bluetooth with an NFC-enabled smartphone. Guinness has been rolling out a mobile brand engagement program using Near Field Communication technology. NXP’s NFC tags are incorporated into thousands of Guinness’ beer founts in the UK and Ireland. A further 60,000 NFC-enabled founts are being planned for 2015. Customers can download the Guinness mobile app onto their smartphone to access Guinness specific content or enter competitions to win a complimentary pint just by tapping their phone against the famous harp symbol. NFC in the pub doesn’t stop at the bar. Brewer Carlsberg has developed a unique ‘NFC beermat’ that enables Danish patrons to access the Crowdit venue discovery app and receive promotions. The NFC tap helps to subscribe to a BLE broadcast, as the campaign is supported by Bluetooth beacons which are used to push special offers to nearby devices running the Crowdit app. Not only does the campaign enable Carlsberg to uniquely connect with patrons, it also encourages footfall and boost sales for operators. Four Levent’s dress shirts for men all come with an NFC tag in each cuff. The NFC tags come preloaded with a link back to fourlevent.com, but can be changed to anything the customer wants via a mobile app e.g. storing one’s contact information on the tag, putting the URL to the own website, etc. Upon delivery, the NFC tags are pre-loaded with Four Levent’s bonus system: whenever someone taps their smartphone on a shirt owner’s NFC tag and then buys from the shop, both get a 20% instant reward. One of the ways NFC deployment is most powerful is when it’s used to connect the physical to the digital worlds – transforming any physical medium and object into users’ dynamic brand and content experiences. An example of this is BMW and Spiegel who teamed up to create the first mass-produced NFC print ad in Germany. NFC smartphone users can launch the new BMW iApp by simply placing their phone on the tagged print ad. They can then explore a range of interactive information and services that demonstrate BMW’s sustainable mobility capabilities. Lexus US were also able to merge the worlds of old and new with its advertisement in Wired magazine. When tapping the ad with and NFC enabled phone, readers were directed to a mobile website to “test-drive” Lexus Enform, the car maker’s in-car navigation and information service, and explore a range of interactive demonstration videos. VivaLnk created a Digital Tattoo, an electronic skin (eSkin) product with an embedded NFC tag. Developed with Google’s Advanced Technology and Projects (ATAP) group, the Digital Tattoo is a paper-thin adhesive worn on the wrist and used to wirelessly communicate with a user’s smartphone. It enables an electronic authentication to unlock the phone for use and makes logging into the device fast, easy and secure. Digital Tattoos are disposable and can be worn for about five days before replacement is required. The Cooper Hewitt Smithsonian Design Museum, located in New York City developed an NFC-based solution for its exhibits that allows visitors to create their own digital designs. Upon arrival, each visitor receives an NFC-enabled stylus, containing an electronic drawing implement on one side and an NFC reader on the other. Visitors can use the device to tap NFC labels which are affixed to, or near, objects — such as wallpapers, lighting fixtures, furniture or vases —throughout the museum. When tapping the NFC label with the reader, it stores information and patterns from exhibits in the stylus’ memory. Visitors can afterwards send the patterns to an interactive screen, enabling them to use the stylus to add things to the design. The guests can then share their creations with friends via e-mail or social media. 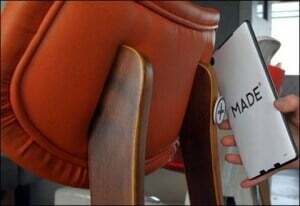 When shoppers arrive at the online retailer’s Made.com furniture showroom, they are invited to use their NFC- powered smartphone, or borrow one of 10 Google Nexus 7 tablets which have built-in NFC readers. An NFC tag has been attached to each item within the showroom, as well as on the showroom’s walls – with products being available exclusively online. If consumers tap their smartphone or tablet against a tag they can see additional information about the item/product. Furthermore, the solution enables them to create a wish list of products they like which they can forward to their e-mail address. The service aims to bridge the gap between online and offline shopping, for those who wish to touch and feel products before purchase. The shop floor is the perfect environment for NFC, enabling brands to engage with consumers to allow for instant information and gratification. News America Marketing (NAM) offers an in-store service called “Smartsource with NFC” which is available for the company’s Shelftalk signs (currently deployed in 58,000 stores). 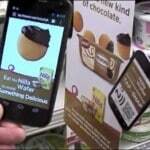 Kraft Food used this NFC-powered in-store signage in US supermarkets. Shoppers could retrieve helpful content every time they tap a shelf talker, including special offers, instructional videos or recipes, and share socially. They were also invited to download the Kraft’s iFood Assistant app to browse more recipes at home, create shopping lists, and locate the nearest store. Aki Choklat’s designer bags are equipped with NFC tags, working with an app and a cloud-based authentication service. By way of tapping, consumers can authenticate their bags, displaying when and where the bags were made. The app also provides the possibility to create a travel diary and track down a bag if it is ever stolen. Really great post about NFC…!! !Thanks For Sharing…!! !